Environmental science students Jessica Balerna, Sara Carpenter, and Alexis Maxwell. Thanks to a team of students in the environmental science program, American University recently received certification in Environmental Planning from the Audubon Cooperative Sanctuary Program (ACSP), marking a significant step forward in the university’s commitment to pursuing environmental excellence. To reach certification, AU had to demonstrate a high degree of environmental quality in wildlife and habitat management, water conservation, and resource management. 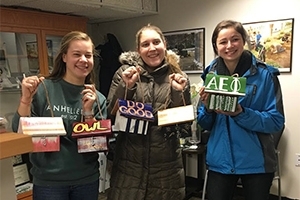 Undergraduate students Jessica Balerna (BS environmental science ’17), Sara Carpenter (BS environmental studies ’17), and Alexis Maxwell (BS environmental studies ’17) spearheaded the ACSP application as a project for their environmental science capstone course with Professor Kiho Kim. AU Facilities Management staff members Stephanie DeStefano and Mike Mastrota suggested the idea, and supported Balerna, Carpenter, and Maxwell throughout the project. As a part of the application, Balerna, Carpenter, and Maxwell created a list of conservation projects that will be implemented over the next few months. These include completing a campus-wide tree inventory; significantly increasing the percentage of low-flow faucets on campus; and providing more AU Sustainability and Arboretum tours to students, faculty, and community members each semester.